Amazingly, some women are still discriminated and discouraged from breastfeeding in the United States. There is an increase in initial breastfeeding; however, the rates drop off dramatically as infants age and women return to work. Now, Congress has a chance to get involved in promoting breastfeeding with H.R. 2819/ S. 1244. 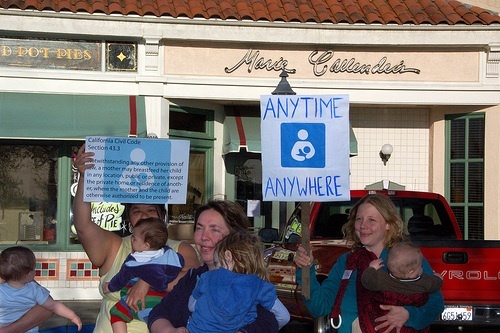 On June 11, 2009, Representative Carolyn B. Maloney (NY) and Senator Jeff Merkley (OR) introduced the Breastfeeding Promotion Act in both houses of Congress, to provide a unified national policy to keep mothers, their children, and their communities healthy. This is the first time the bill has been introduced in the Senate. Although title VII of the Civil Rights Act of 1964, as so amended, applies with respect to ‘‘pregnancy, childbirth, or related medical conditions’’, a few courts have failed to reach the conclusion that breastfeeding and expressing breast milk in the workplace are covered by such title. 47 states have enacted pro-breastfeeding legislation, but “the Breastfeeding Promotion Act to provide a unified national policy to keep mothers, their children, and their communities healthy.” It is time we had a national policy on breastfeeding! Thank you for posting this! Mothers deserve this right and it should be promoted. Good! We can use a stronger, consistent answer at the Federal level. The weird suppression of the natural gift of Mother’s milk is one of those unhealthy anxieties that society has allowed to take hold, and it is related to the overall misunderstanding of the nature of our bodies, sexuality, pleasure, and parent/child bonding. The benefits of breast feeding to child and to parent are too well known to repeat here. Geesh! You’d think in this day and age and with all of the harmful things we and our children are exposed to on a daily basis, you could at least be allowed to put something wholesome into your child without people making you feel bad. Thanks for helping to keep the attention on this. I’d also like to see health insurers be required to pay for a breast pump rental when there’s a medical reason for it (i.e. not just that the mom wants to return to outside employment).